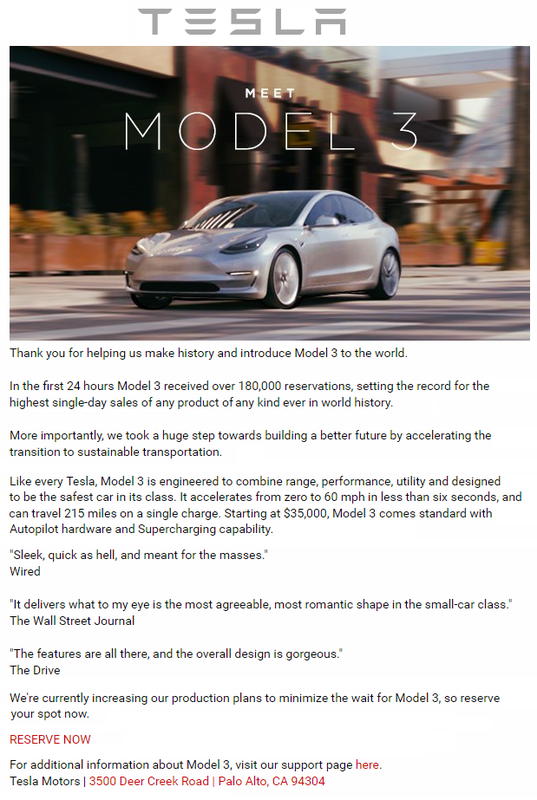 In an email sent out last night (see below), Tesla confirmed that following the overwhelming number of Model 3 reservations it received, the company is currently “increasing its production plans to minimize the wait for Model 3” – something Elon Musk hinted Tesla was looking into after witnessing the long lines of people waiting at Tesla’s stores to reserve the $35,000 long-range all-electric vehicle. The automaker added that it set the record for “the highest single-day sales of any product of any kind ever in world history” after receiving over 180,000 Model 3 reservations in the first 24 hours. Tesla CEO Elon Musk updated the number of reservations throughout the weekend to 276,000 as of Saturday and he said that he would update the number again this morning for the first week since the unveil. We will update our timeline of Model 3 reservations once the new number becomes available. Elon Musk confirmed being surprised by the number of reservations and that he was only expecting half as many or even just one-fourth. The production ramp up will be particularly important for Tesla’s customers in the US. Once 200,000 people have benefited from the $7,500 tax credit for EVs from one manufacturer, the rebate starts to phase out over a 12-month period, but the restriction changes from an amount (200,000 units) to sales over a period of time (12 months) – meaning that it is in Tesla’s and its customers’ best interest for the Model 3 to be at volume production once Tesla hit the 200,000 cap, which the automaker is expected to hit in 2018. For example, if Tesla is only able to deliver 10,000 Model 3 in the US before reaching its 200,000 units cap, but Model 3 production is at ~3,000 units per week at that point, then Tesla could focus its sales in the US for a period of time and tens of thousands would still be able to get access to the full tax credit and many more to the partial tax credit.